This forms a pair with the portrait of Robert Browning (NPG 1898), also commissioned by Mrs Eckley. The latter had met the Brownings in Rome in 1858. She helped to introduce Mrs Browning to spiritualism, and became, for a short time, an intimate friend. Relations became strained around 1860, and were not resumed. In later years, Robert Browning heard disquieting rumours that the letters he and his wife had written to Mrs Eckley were being shown to her friends, with a possible view to publication. This breach of confidence did not occur, and the letters, together with the portraits, were bequeathed to Browning's son. Mrs Eckley's insistence that she had the best portrait of Mrs Browning was not a simple case of proud possession. Two other friends of Mrs Browning, Miss Heaton and Isa Blagden, were extremely hostile to Mrs Eckley, and did all they could to undermine her influence. Miss Heaton actually commissioned the chalk drawing of Mrs Browning by Field Talfourd (NPG 322) to outdo the Gordigiani portrait. Miss Heaton was equally insistent that she had the best portrait. This bitter rivalry did not go unperceived by Mrs Browning. 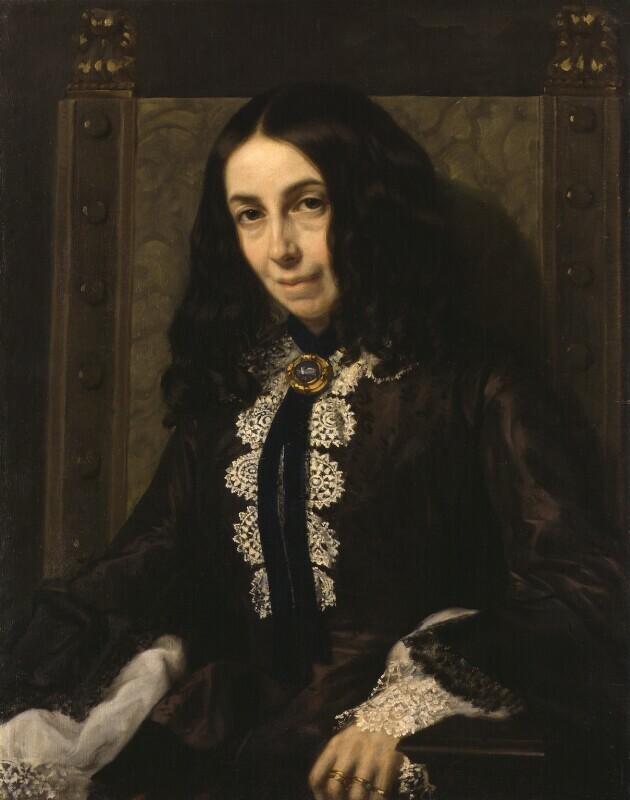 She wrote to her sister that Miss Heaton had made herself very unpopular in Florence by her lack of refinement, and by her 'resolution to "have the only portrait in the world of Mrs Browning" ... dear Sophie Eckley being really wounded by the slight done to herself and her Gordigiani in Florence' (McAleer, p 31). 'The portrait is not perfect certainly; the nose seems over long, and there are some other errors in the face; also, the whole figure gives the idea of a larger woman than Ba: but the artist himself was so fully aware that much was yet wanting to the line work, and not a little remaining to be comprised in it, that I wonder he allowed you to come into possession at once; when the accessories (chair and table) are added the main figure will be reduced to its proper proportion - and at our return, Ba will sit to his heart's content: but I am glad to believe, with you, that something, indeed much has been secured - and most glad as I said, that it gives you the pleasure it should. I know, if we had in this Hâvre, a portrait of you, equally true to our recollections, we should look many a long look at it, and say many a sincere thing. In the second paragraph of this letter, Browning was referring to Mrs Eckley's plan, already then in her mind, to leave the portraits to 'Pen' Browning. Mrs Eckley clearly refused to relinquish the portraits. In another letter to her (c.August 1859) Browning said that he and his wife now agreed to her plan (i.e. of bequeathing the portraits to 'Pen'), and made no further attempt to obtain them. In any case after 1860 Browning ceased to see or write to Mrs Eckley, following the break between her and his wife. In a letter of 14 February 1911 (NPG archives), Mrs Gordigiani (the artist's widow), wrote to 'Pen' Browning to ask if she could borrow the two portraits for an exhibition in Florence, Mostra del Ritratto Jtaliano della Fine del Sec. XVI all 'Anno 1961. In her second letter of 1 March 1911 (NPG archives) she says that the portraits have still not arrived, and wonders if they have been mislaid in transit ('Pen' had evidently agreed to lend them). As the two portraits are not mentioned in the catalogue, they presumably did not arrive in time to be included in the exhibition. Mrs Gordigiani called them the 'deux des plus beaux portraits qu'ai fait mon pauvre mari'. Gordigiani was a minor provincial artist, who painted several portraits for English patrons. New Letters of Robert Browning, edited W. C. DeVane and K. L. Knickerbocker (1951), pp 109, 123-4. Dearest Isa: Robert Browning's Letters to Isa Blagden, edited E. C. McAleer (1951), pp 31, 44, 306-7, 309. Pale complexion, dark brown eyes and hair. In a dark dress with white lace cuffs and bib. Brooch at her throat, with a blue stone, on a dark blue velvet ribbon. Chair-back covered in green figured material. Rest of background dark brown. Commissioned by Mrs Eckley; bequeathed by her to Browning's son; R. B. Browning Sale, Sotheby's, 1 May 1913 (lot 59), bought Mrs Florence Barclay; presented by her husband, Charles Barclay, in accordance with her wishes, 1921.